RafflesEducation is a premier education Group that is committed to providing quality education and education-related services through its network of institutions across Asia-Pacific and Europe. Our strategic goal is to nurture and groom skilled professionals through the transfer of industry-relevant knowledge and technical know-how to succeed in the globalised economy. The Group strives to provide a well-balanced education that encourages creative and critical thinking, thus allowing students to realise their potential and aspirations, while enjoying the learning process at our colleges. 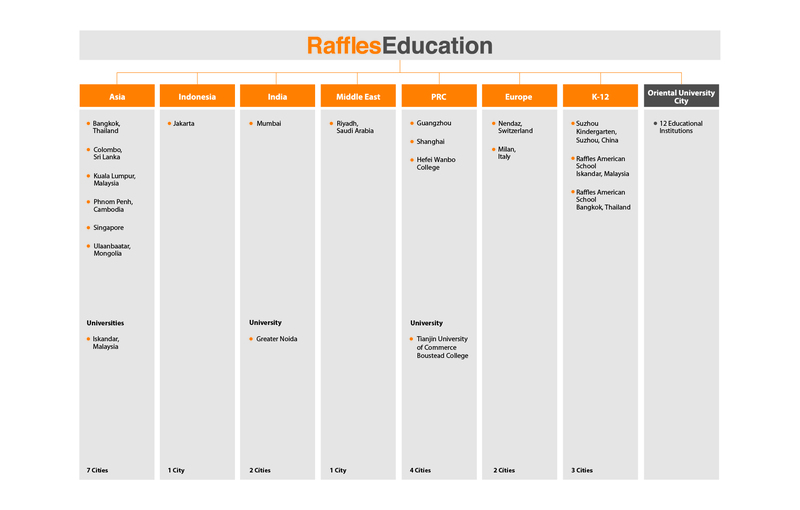 Since its founding in 1990, RafflesEducation has grown its portfolio from one college in Singapore to 22 colleges/universities in 20 cities across 12 countries. Raffles University System is the principal body that has the overall responsibility for coordinating and harmonising the curriculum, quality assurance of content and delivery, as well as improvement of academic programmes for the Group’s network of colleges and universities. Raffles University System has a stringent and rigorous reporting and audit system to ensure quality standards and assurance, as well as operational compliance.